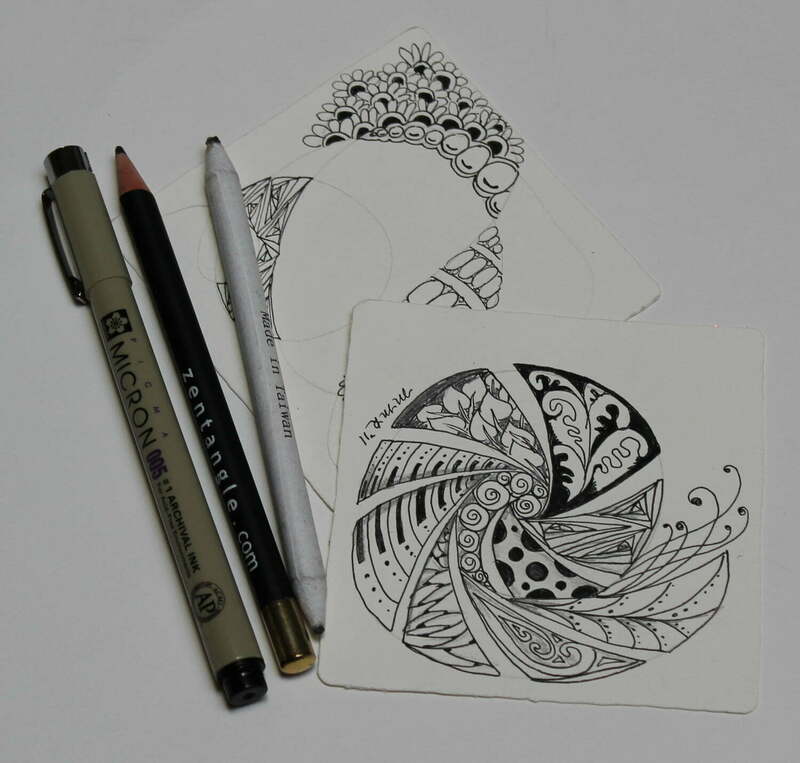 What is Zentangle® and Zentangle-inspired art? I am a Zentangle® zealot and a Certified Zentangle© Teacher or CZT as we are affectionately called. I will “tangle” anything! I recently tangled my iPhone cover and a wooden birdhouse for the back yard. People are tangling jewelry, clothing, gourds and fabric. It’s become quite an international craze! But that’s not the real reason I love Zentangle® or an apt description of what it is and how it has changed my life for the better since I discovered it almost 10 years ago. My Zentangle journey reminded me that I am an artist. I now comfortable claim that title and sell my original artwork. I have always been a doodler, drawing lines, shapes, hearts and flowers in the margins of my notebook or on a pad of paper while talking on the phone. You will find me doodling on napkins in restaurants and I love restaurants that have dining tables covered in butcher paper and provide crayons to draw with. But Zentangle is different. When I first discovered the process on my friend Violette’s blog, I was immediately intrigued. I had been looking for a new hobby and creative outlet. I was hooked! I found that the meditative process of Zentangle freed the creative spirit that I didn’t even know was blocked! I find that while I am tangling, my hands are busy, freeing my mind to wander and allowing other creative ideas to flow in. Not only are the completed tangles gorgeous, but this is a process that anyone can do. It’s a perfect process for remembering how to be creative! I stumbled around a bit on my own but eventually found a local teacher in Carrollton, TX and took a private class. That was over 9 years ago and my joy in tangling hasn’t slowed down yet. My favorite class was the private session I took with Sue Clark in Colorado, her work inspires me! She lives close to my mom so I took advantage while on vacation to work with her in her studio. In June of 2014, I continued my educational journey by traveling to Providence, RI to study with Rick and Maria and become a Certified Zentangle Teacher. While my primary work is as a Creative Depth Coach and business consultant for Creative Business Owners, I have found that teaching the Zentangle method to others is very fulfilling and helps others to get in touch with their creative spirit. I find that creativity is crucial to our success in our work and in our life. The official Zentangle tile is a 3.5 x 3.5 inch square. It’s small size makes it easy to complete in one sitting, allowing busy individuals to tangle anytime or anywhere. Here’s what I appreciate about this art form: it reminded me that I am creative and love to draw; I have always been a creative person and Zentangle gave my art-making purpose and meaning; I appreciate how portable it is and the interaction among the online community of other Zentangle fans and CZTs is motivational and rewarding. Zentangle is not doodling because it does follow a structure of simple patterns and is a lovely meditative practice. For more details on the process itself, visit Zentangle.com. Make sure to read Rick and Maria’s blog for beautiful examples of their work and new patterns they are creating. The act of creating a Zentangle is known as tangling. For legal copyright and trademark reasons, there is no such thing as “Zentangling”. Zentangles are miniature pieces of unplanned, abstract, black and white art created in a very structured method from an ensemble of repetitive patterns on a 3.5-inch (89 mm) square paper tile. They are not only exquisitely beautiful, they are fun and relaxing to create. The process of creating a Zentangle® is a form of “artistic meditation” as one becomes completely engrossed in making each pattern, deliberately focusing on “one stroke at a time”®. The creativity options and pattern combinations are boundless. And anyone can do it! As CZT® Margaret Bremner has written, “One of the lovely things about Zentangle is that it isn’t supposed to BE anything. Even more, it’s SUPPOSED to NOT be a something. … Zentangle is simply a lot of beautiful patterns playing harmoniously together. Zentangle-inspired art (ZIA) is another story; it can be Something if you want.” For more information about Zentangle, visit Linda’s page here. Zentangle is an art form that anyone of any age or skill can enjoy. It’s a great tool for children and is often taught in school programs. In fact, there is now an official Zentangle Apprentice Classroom Pack that includes lesson plans and supplies. It is available on the Zentangle.com website, along with more information on how to get started. If you struggle with focus or have children who struggle to stay focused, Zentangle is an excellent tool for increasing attention and ability to concentrate for longer periods of time. All you need to start tangling today is some simple instructions, white 3.5 x 3.5 paper tiles on a heavyweight paper (Bristol board is great), a pencil and Sakura Micron pens in size 01 and 05. You can order an official Zentangle starter kit on the Zentangle website or on Amazon.com. That’s it! No long list of expensive supplies. These tools will all fit in your purse or briefcase so you can tangle sitting at Starbuck’s waiting for your next appointment. The best way to get started is with a private Zentangle lesson. If you live in the Santa Barbara, CA area and want to learn more, email me at minette@minetteriordan.com. I would be happy to share what I know! If you live somewhere else around the country, I can also offer private lessons via Zoom! These are beautiful and fascinating, too. I’m going to share this with my daughter–she’ll love them!! Thanks, Amy. Zentangle is addictive!! I love your Zentangles! I’ve tried it myself a few times and enjoyed it, but I haven’t developed a habit of it. I do doodle in my journal sometimes, and doodling tight patterns got me through college and graduate school. My notebooks were full of drawings and designs. They helped me listen to the lectures. I’m looking forward to reading more of your posts. Thanks, Holly, for the feedback. I, too, doodle on anything that won’t move and my notebooks were full of doodles more than notes. Doodling helps me stay focused on the listening! your work is magnificent. My friend, Linda just created a webpage named completeartattack.com and is is lovely as she is a self taught artist, and zentangle appeared on her page…since then, about two weeks ago I have done two zentangles…but I used colored pencils to fill in the space and they are gorgeous to me. thanks for you designs, and encouragement…zentangle sure is relaxing…yepper I think I AM ADDICTED to Zentangle for sure. hugs junie from nova scotia canada. Hi Minette, We met in Florida a few years ago at a Courage to Lead event. I was scanning the internet for zentangle pattern ideas and came across your page. I just started this a few months ago and love it! I’m always looking for new patterns. It was fun to “reconnect” with you again. I hope you are doing well. Take care. Hi Minette from NW INDIANA. I too am a tangling addict. I work in a state prison and trying to get up the confidence to teach zentangle there. I have tried it with 5 offenders that work with me on a daily basis and they loved it. I have been tasked to teach crochet presently. Again, the confidence issue, or lack there of. I volunteered when I thought it was going to be teacing about 10 one hour a week. But my boss says he wants mt to teach an hour a day and the entire dorm needs to learn. I’m overwhelmed, that’s 320 men. I have a demanding boss. Sorry, i got away from zentangle. I love it. I don’t think about snacking, or smoking, and I zone out. Would love to share more, but this is supposed to be for short comments. Thanks for being you. Is the word Zendala also a registered trademark of the Zentangle people, or is it yours? It is a registered trademark of Zentangle.